Set on the border of Angus and Perthshire just off the A94 between Coupar Angus and Meigle. The Tavern in the village of Ardler, nestled between the Grampian mountains and the Sidlaw hills has been trading for over 100 years, catering to the needs of locals and travellers alike. A popular area for walkers, cyclists, field sports and fishing enthusiasts, whether you're coming to dine or just popping in for a refreshment we are here to welcome you after your day's activities whatever your preferred pursuit. We have two letting rooms available, be it our cabin in the garden or the self-contained unit in the main building, you are guaranteed a restful stay. When the sun shines relax in our beer garden and if it should be hiding enjoy a tipple in front of our wood burning stove. There are no strangers at the Tavern , just friends we have not met yet ! Enjoy a fabulous choice of menus, including our main menu and high tea, all at great prices. Our steak pie is not to be missed along with our roast chicken and skirlie. We also offer a number of vegetarian starters and mains, plus a childrens menu. 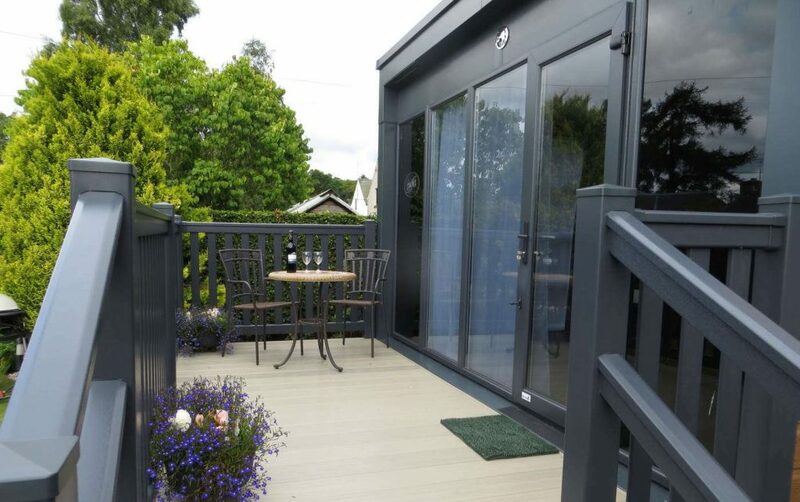 If you choose to stay with us at The Ardler Tavern we have a choice of a double room in the Tavern, or a brand new glamping pod situated at the back of the property. Whichever you choose, you can be certain that the facilities are excellent and perfect for your stay. Here at The Ardler Tavern we can offer you a tipple of whatever you might fancy. 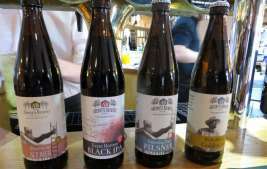 Including some ales for the nearby Abernyte Brewery. We also offer a range of wines, spirits, mixers, soft drinks and hot beverages. Lovely welcome by the owner Jim followed by an excellent High Tea.....so much food we had to take cakes home! Well worth a visit but advisable to book at weekends. Although within a few minutes drive, the last time I was in the Ardler Tavern was probably over 30 years ago. My loss. The friendly young waiter / barman obviously knew his job well, taking our drinks and food order promptly and efficiently. Although we did not have starters, our main courses arrived promptly. 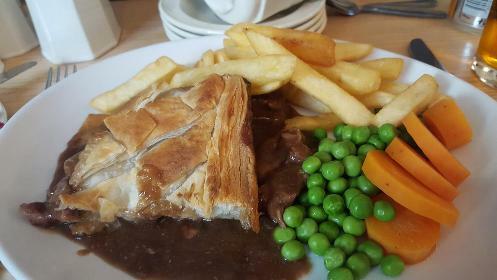 My steak pie was excellent, a generous portion, tender beef, rich tasty gravy and that full of flavour layer of soggy pastry between the filling and the crust that proves they were baked together. The chips were near perfect. The only reason I have not given full marks is because the pie and my clootie dumpling (google it!) were not nearly hot enough. We will be back and expect to be able to give 5 stars this time. Having traveled the road to Dunkeld for a great number of years, this was an Inn we had noticed but today we thought we would try it. We were not disappointed and had a gorgeous lunch with good service and wonderful surroundings. We will definitely be back. Also very good value for money. Lovely food and friendly staff in a pretty village setting. It's a great place for a stop over if you're walking the many paths and tracks around Ardler and Newtyle. We made a 30 mile trip to go there. It was worth it. Fabulous food and fabulous staff. Go there it's fantastic and definitely worth a visit , try out a cocktail. Have been there other times and looking forward to celebrating my 50th birthday there very soon. This is a lovely place to eat, you are always guaranteed an excellent meal here, and, there are always good choices on the menu and also the 'specials board' we have never been disappointed. The scampi is the best I have ever tasted! The Highlander which is sometimes on the 'specials' is highly recommended! There is a cosy fire to add to the welcoming atmosphere. Jim is the perfect host, he always makes time to have a chat, and Ethan is always very pleasant, friendly and attentive. All in all a great place to dine. We have passed the road end where the sign for the Ardler Tavern is but never ventured up it until Wednesday and what a find. We hade stopped at the Quirky Cuckoo in Meigle and as the restaurant next door was closed and we really rate the Quirky Cuckoo, we asked the lady in the shop if she could recommend anywhere. She described it as "Very good, locally sourced pub grub" and she was bang on the nail. The SteakPie was filled with delicious beef from the local butcher and had been cooked with the lid on and it was absolutely delicious!! Mushroom soup was also homemade and of the same quality. The veg was all fresh and there was so much we did not have a meal later in the day! !The young man serving could not have been more helpful and the Tavern itself was clean, warm and welcoming. First time here last night and a wee hidden gem! The meal was beautiful and staff friendly with a lovely atmosphere. Will definitely be back. It was heluva night of sleet and cald winds, but we braved the weather and drove to a place where we knew there'd be a welcome fire and warm greeting from the boss himself, the redoubtable Mr Jimmy Duncan. No disappointment... the place was packed and if everyone was not enjoying that Saturday night in the Ardler pub, then I am the proverbial Dutchman. And what feast we had... the 'special' was "braised steak wi' a' the trimmins" and could not have suited us better... We all had it. And, for less than £25 a heid, including starters and wine, we headed home replenished and satisfied. If you've no' been there yet... Gae ! Very enjoyable evening, good sevice and food. Nice warm atmosphere, friendly staff and very attentive. Our motorbike club recently had our twixtmas meal in the Ardler Tavern which was excellent. The food was lovely, plentiful and with great friendly service. Everyone was served with efficiency and smiles and we all ate at once, quite an achievement these days! Ten out of ten to Jim and his staff. We will definitely be back again and again. We were at the Tavern in Ardler for the first time because our habitual watering hole was fully booked for a festive season party. The Tavern itself was busy, but we were warmly received and were served with an excellent and copious meal. My companion said the haddock was the best she had ever tasted, and my steak pie was first class. Our plates were hot, something that makes such a difference to having an enjoyable meal. Our only criticism would be that the choice of wine appeared somewhat limited, but that's maybe just being picky. We will be back. My family and I ordered four high tea dinners on a Sunday. We started off with steak pie and chips, chicken and skirlie, two haddock filled fish cakes with chilli sauce and a jam and prawn salad. All meals were hot and delicious. Following the main course we had a selection of toast, cakes and tea and coffee. The service was friendly and professional. I would highly recommend the Tavern Ardler to all past and new customers... excellent meal. Lovely place to enjoy home cooked food. Wood burning stove on a cold day is so welcoming along with the friendly staff. Beer garden in the summer is just so relaxing. Shh, don't tell too many folk or I won't get a seat & the steak pie will be finished. We have eaten here regularly since the new owner took it over. He has turned it into a much loved local village pub. Most of the food is locally sourced and the menu and quality of food is first class. As is the service !!! Highly recommend.